I too am having cruise control problems on my 2000 Honda Accord EX. I was looking at the throttle body and saw that the cruise cable was laying limp in the groove. I rotated the cam and see that the hole for the cable boss is broke. The throttle body is the problem but I refuse to buy a new one. I will go to a Pull a Part to find a used one or will manufacture a fix for the one I have. I will let you know how that works out. 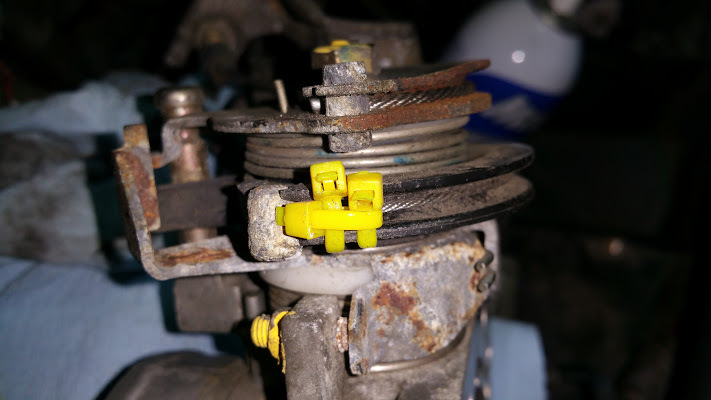 A throttle body is able to cause cruise problems. Easy to find but not easy to fix if you dont go for the new OEM parts. Let us know how it goes and which way worked out for you. Please post something close to a response or help WITHOUT that attachment. Not sure if you are a spammer or not. I see you are in CA so I didn't ban you right away. check the vacuum. If the actuator is not getting vacuum it will not engage. i did pull on the cables earlier and they seemed taught. i could not find any vacuum tubes to the actuator...does anyone have any pics? well i think i found the issue with my cruise control...will check for that cable this weekend. Last edited by footprintsinconc; 10-07-2016 at 05:39 PM. found the cable end for cruise control was hanging out there...will have to remove the TB and try to fix it without replacing the TB. poor design on Honda's part, unbelievable. its the same issue that everyone has had where the plastic thing that holds the cable is broken. some people have epoxied the end of the cable ball into the plastic thing...this will restrict the cable end from turning when its pulled on, isn't that going to restrict or break something else? I fixed the cruise control! here is a pics and video of how to do it...thanks to cowsarered suggest fix! Last edited by footprintsinconc; 10-23-2016 at 09:24 PM.